Here's a basic procedure on how to buff a floor to a nice scratch-free shine. One of our high speed floor buffers works best here. If you need to remove heavily embedded scratches and dirt, then this is the procedure to start with. This leaves a clean base to apply a new finish coat to. This finishing procedure helps improve slip resistance on your tile floor. It also helps your floor in being easier to clean. 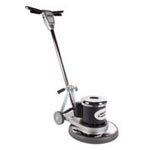 An overview of the types of floor machines that are most commonly used for cleaning hard floor surfaces. Do you need to remove surface embedded scratches, scuffs, and dirt? Using a single disc machine could be the answer. If you need to strip a floor of old wax, this is the procedure to follow. A special stripping solution is needed here. Video tutorial demonstrating how to install and remove a low speed rotary floor buffer brush. Our database of floor sanding videos, concrete refinishing videos, and deck sanding videos. Compares and contrasts high speed floor burnishers and low speed rotary floor buffers. Discusses appearance, operation, and uses of each. Video tutorial demonstrating how to install and remove a low speed rotary floor buffer pad driver/holder. Video tutorial demonstrating how to install and remove a high speed rotary floor buffer burnisher pad. Video tutorial demonstrating how to install and remove a low speed rotary floor buffer pad.